BMM houses some of the best creative minds who will be the future actors, journalists, designers, ad and film-makers. Students enter this course with merit, passion and dreams. Creativity is not just the way they like to think, it’s the way they like to live. BMM gives students ample opportunities to learn and excel in their area of choice, after exploring all facets of media. After all, creativity is inventing, experimenting, growing, taking our risks, bending rules, making mistakes, and creating a new path and having fun. 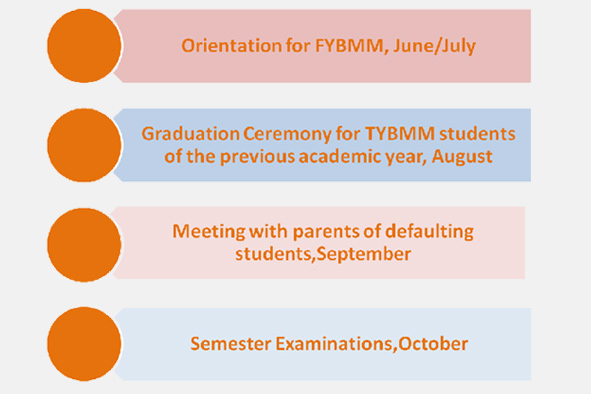 The BMM programme ensures that you do it all! This unique course is about lectures, presentations, projects, performances and festivals, which constantly test the skill, patience and talent of the student. No matter where they go in the future, they would never forget that they were a JAI HIND-BMM STUDENT because it was not just a knowledge acquiring exercise but a life alternating experience. University of Mumbai introduced the 'Bachelor of Mass Media' (BMM) course in the year 2000. However, Jai Hind College started the course in 2002 and was headed by Mrs. Mohini Dias. Despite starting the course late, the response of students for the selection examination was good. About 600 students appeared for the examination and 60 were selected after a round of interview. Since then the Department of Mass Media has emerged as a vibrant, dynamic and ever enthusiastic department. In the year 2007, Dr. S Varalakshmi took over as the Coordinator and Mrs. Akila Bharat, as the Assistant Coordinator (in 2008) of the BMM course. 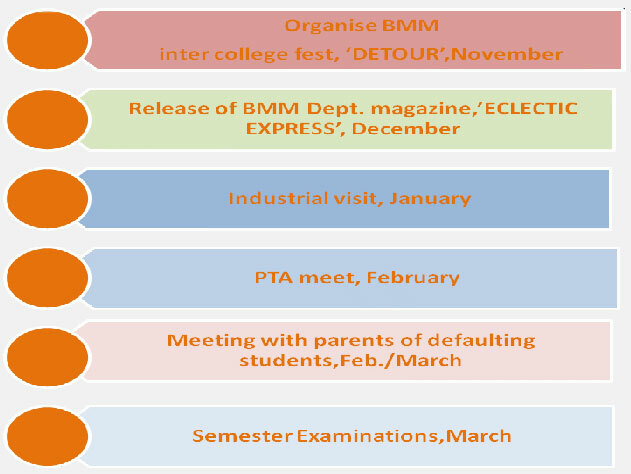 It was under their guidance, that Jai Hind College’s exclusive BMM festival, DETOUR, was organized in the year 2008. The department grew from strength by strength by increasing the number of seats from 60 to 66 due to an increase in the applications received ever academic year. Importantly, in the recent past we have also been securing University ranks year after year along with winning and organising intercollegiate fests. BMM is a course that gives students hands on experience of the happenings in the media industry. 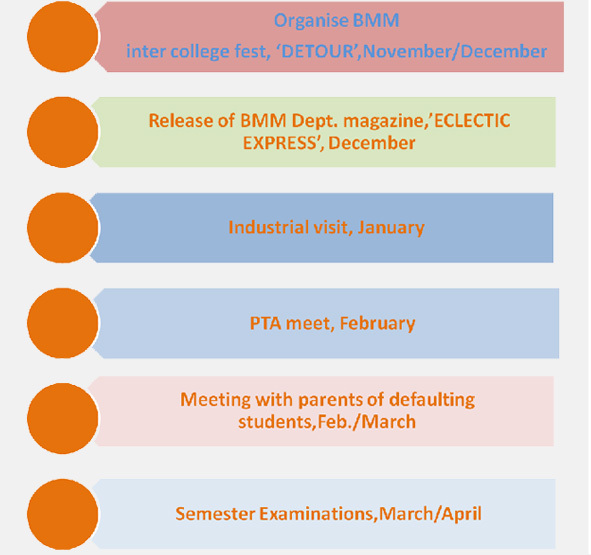 Along with regular classes, numerous guest lectures and workshops are organised not just on media related subjects but also on other diverse subjects ranging from Social Sciences like Political Science and Sociology to Management related subjects like Public Relations and Organisational Behaviour. The students are also taught the basics and advanced level of computers which enable them to work on softwares that help in designing and developing advertisements and magazines. The course is a blend of both, theoretical and practical education. 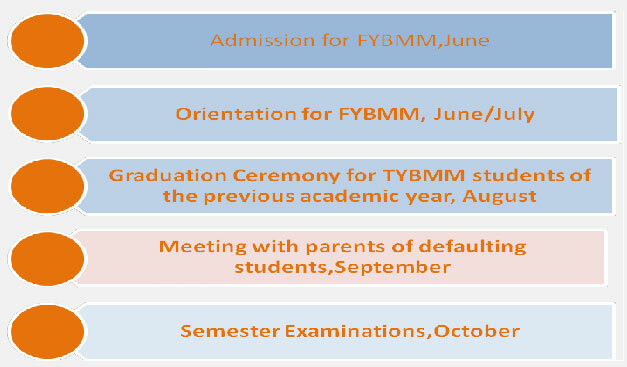 Internal Assessment in the form of projects and assignments is an integral part of the BMM programme. 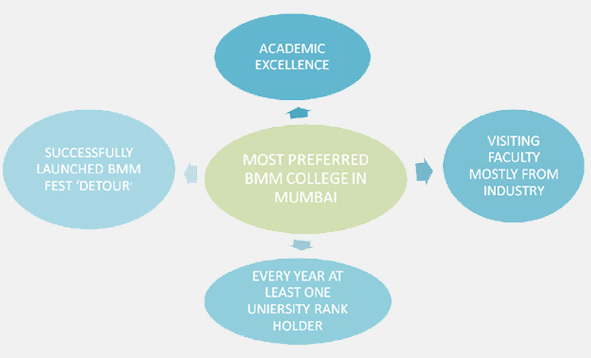 Jai Hind BMM has become the most sought after programme in the city as the Department has taken the education beyond the prescribed format. Students are encouraged and constantly challenged to do the same. The students are given projects with an industry interface and thus giving them maximum exposure to the functioning of media industry. Some of these assignments include making documentaries on the various sub-cultures in Mumbai, tracing the life history of a brand through its advertising campaigns, investigating unusual human interest stories and so on and so forth. An emphasis is put on developing communication skills along with professional standards and ethics. M.A., Ph.D.(Eng), Diploma in Journo. M.A. (English), MBA (MIS & e-business).